SH3BP2 antibody LS-C18896 is an unconjugated rabbit polyclonal antibody to SH3BP2 from human, mouse and rat. Validated for ELISA and WB. SH3BP2 antibody was raised against synthetic peptide from human SH3BP2. aa 422-433 of Human SH3BP3 protein (SH3 Domain Binding Protein 2). 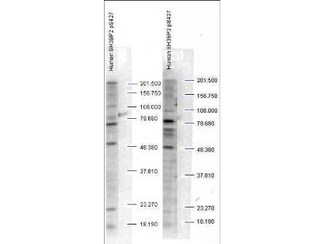 This affinity purified antibody has been tested for use in ELISA and by western blot. Specific conditions for reactivity should be optimized by the end user. Expect a band approximately 60 kD in size corresponding to SH313P2 by western blotting in the appropriate cell lysate or extract. Anti-SH3BP2 pS427 Antibody - Western Blot. 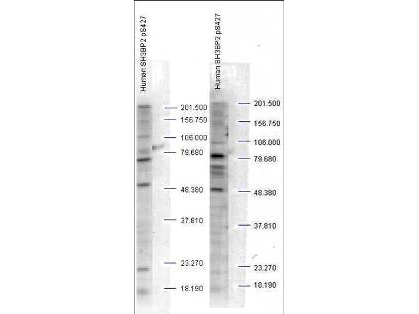 Western blot analysis is shown using Affinity Purified anti-SH3BP2 pS427 antibody to detect endogenous protein present in unstimulated human whole cell lysates). The band as indicated by the arrowheads is evident in both M059 cells (panel A) and PC-3 cells (panel B). Comparison to a molecular weight marker indicates a band of ~60 kD corresponding to human SH3BP2 protein. The blot was incubated with a 1:500 dilution of the antibody at room temperature followed by detection using standard techniques. Personal communication Steven Pelech, Kinexus Inc.